Suffering ushers in a unique strain of insanity—even for the Christian. We “people of the Book” may “profess ” to know what we believe and why we believe it, but let hardship enter the picture and the pieces of our lives are suddenly broken in the air above us. What’s more, we often are not sure how they are going to land or even if they will fit back together. Job was well acquainted with suffering. He lost his family, his property, and his health. And it appears as if the Holy Spirit breathed out the Book of Job in such a way as to reveal the insanity that suffering generates. Job begins well in his suffering—“Naked I came from my mother’s womb, and naked shall I return. The LORD gave, and the LORD has taken away; blessed be the name of the LORD” (Job 1:21). One minute trust. The next minute chaos. Compound this with Job’s three hair-brained friends who seek to “comfort” Job with their ivory tower rhetoric. They assess that surely Job must have some hidden sin in his life because God does not punish the righteous. Towards the end of the book God proclaims that all of Job’s friends are wrong in their spiritual diagnosis of Job (see Job 42:7). It is not until God speaks up to Job that Job is finally able to rest in God’s sovereignty over his life. Like a house of mirrors, he doesn’t know whether he is skinny or fat—resting in God or pacing the floor over God’s silence. And the Book continually goes in circles like this, I think, because suffering goes in circles like this. Sometimes God is closer than our next breath, and sometimes it feels like He is three galaxies over. My prayer is that God will help us to see the minutia of blessings in the middle of this insanity of our suffering. The broom tree is a shrub that is found in the deserts of the Middle East. Temperatures can reach as high as 125 degrees Fahrenheit (and higher) in these desert lands. The desert is a biblical metaphor for suffering because in the desert there is no water, very little vegetation, and rocky terrain. Consequently, there is little to no relief from the intense heat. 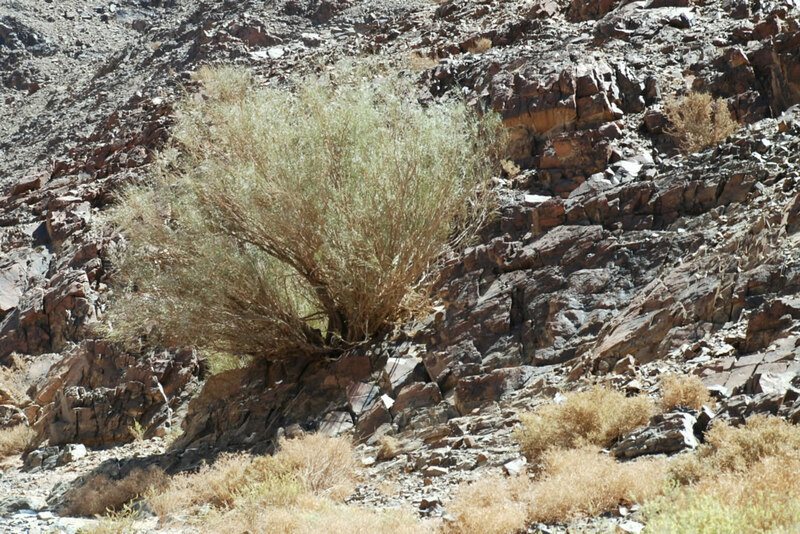 The broom tree (pictured above) grows out of the rocks in the desert and can sometimes be relatively large. The shade it produces does not totally darken the ground, but it is sufficient to drop the temperature several degrees from the surrounding climate. This shrub, though seemingly insignificant given its environment, is the minutia of blessing to which I refer. Though suffering raises the temperature of our lives, there are broom trees available to shade us if we will look for them. A primary lesson that God is trying to teach us in the midst of suffering is to depend upon Him completely, one moment at a time. The broom tree is evidence that God is with us on our journey through suffering in spots to give us relief and to enable us to carry on one more minute, one more hour, one more day. God intends not only to save His people but also to use them to bring relief to others who are suffering. He longs to have living broom trees all over the face of this earth that can be useful to comfort those who are hurting. But God must first teach you of His great provision, of His never-ending faithfulness before you will ever be equipped to shade those who need it. Therefore, he allows our suffering and just enough relief along the way to insure us of His presence and provision. It is through time and through the recognition of God’s provision in our lives that He is not only supplying us with aid but also equipping us to help other people. Job’s story of suffering has been and continues to be a massive help to people throughout the ages. What might God be supplying and equipping YOU with right now? This truth is clearly taught in Scripture as you point out so well Bo. How vital it is to include such truths in equipping the saints for the walk in Christ that most assuredly encompasses trials. I deliberate whether to forward this great insight to someone who is a believer engaged in the final stages of a battle with cancer. It is so encouraging for one who has progressed from feeding on the milk to the meat of the word. Am praying for wisdom in sharing this with him at this point. Thanks so much for the insights seen in the analogy of the broom tree.